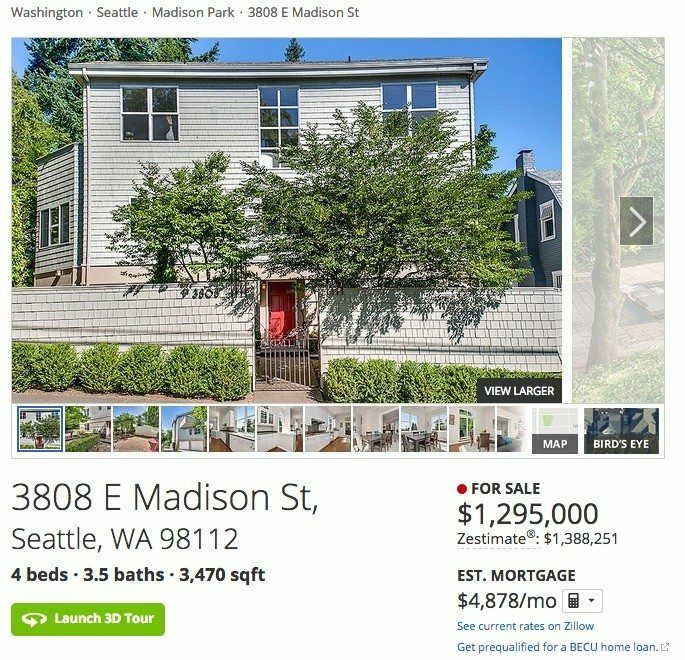 Zillow Group CEO Spencer Rascoff recently listed a four-bedroom home in Seattle, Washington, for $1.295 million. We decided to ask ourselves: What can Rascoff’s listing on Zillow teach us about Zillow? The answer is “a lot.” Here are some of the most relevant takeaways for real state agents. 1. Zillow’s CEO believes in using real estate agents. Rascoff has repeatedly sung the praises of real estate agents, Zillow Group’s primary source of revenue. Stephenson is co-owner of Real Property Associates and sits on the board of directors of Zillow. How did Stephenson win Rascoff as a client? “Because we have a long-standing professional relationship due to my work with [Zillow] and we developed a friendship,” Stephenson said. 2. Zillow listings can feature virtual 3-D models. Zillow began allowing sellers to embed graphics linking to virtual 3-D models in listings earlier this year. Stephenson added one of these models to Rascoff’s Zillow listing. Zillow currently only features 3-D models produced using a camera and software provided by Matterport. But the listing portal seems likely to host representations built using technology from other 3-D providers in the future. StreetEasy, a New York City-area listing portal owned by Zillow, displays 3-D floor plans powered by Floored. What can Zillow CEO”s listing tell us about Zillow? 3. Sellers can (often) add more content to listings on Zillow than on the MLS. Stephenson said he can’t prominently feature a 3-D virtual tour in an MLS listing or include images of neighborhood amenities, such as a nearby beach, coffee shop or park. But on Zillow, he was able to flesh out the original MLS listing by adding a 3-D tour, an aerial image of the neighborhood, more photos and additional listing copy. Zillow “let us put anything in there that we think is relevant to the property,” he said. 4. Zillow can get listings directly from real estate agents or brokers. Stephenson said most of the content in Rascoff’s Zillow listing came from a direct listing feed provided to Zillow by Real Property Associates. The rest, like extra photos and listing copy, Stephenson manually added himself. More than 9,000 brokerages provide direct feeds to Zillow. In return, listing agents are supposed to appear next to details about homes that they represent on the portal, and a linkback to the listing broker’s website is supposed to be provided. Zillow also gets listings through direct feeds from multiple listing services (MLS). The listing portal has signed direct feed agreements with MLSs at a breakneck pace ever since news broke in January that listing syndicator ListHub, a subsidiary of realtor.com operator Move, would stop sending listings to Zillow. Zillow doesn’t have a direct listing feed agreement with the Northwest Multiple Listing Service, the MLS covering Seattle, “but we have great relationships with many of the large brokers in the region,” said spokeswoman Amanda Woolley. 5. Agents can promote and shield their listings from buyer’s agent ads. As a Premier Agent, Zillow’s name for its agent advertisers, Stephenson can choose to promote a certain number of listings on Zillow as “featured listings.” Featured listings appear prominently in listing search results. Featured listings also only display the contact information of the listing agent on a listing, shielding the listing from the buyer’s agent ads that normally appear on Zillow listings. In promoting Rascoff’s listing as a “featured listing,” Stephenson has provided Rascoff’s listing with this immunity. 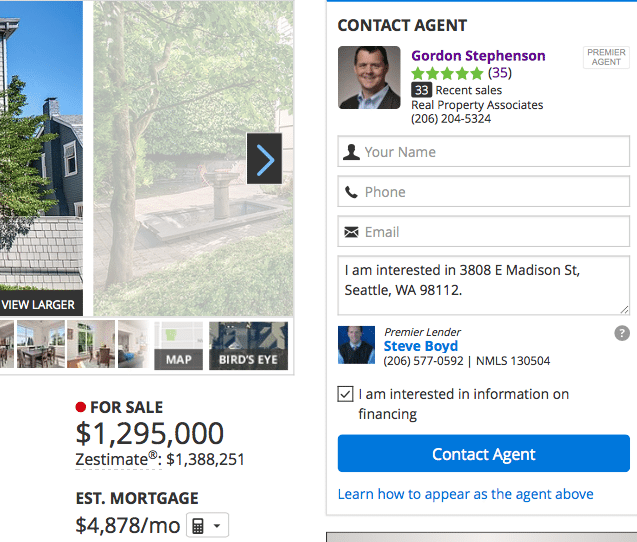 Since Rascoff’s listing is a ‘featured listing,’ the listing agent, Stephenson, is the only agent that appears on the listing. Since Stephenson alone shows up on Rascoff’s listing, prospective buyers who visit the listing and want to learn more are more likely to reach out directly to Stephenson rather than another agent. 6. Agents can bolster their image on Zillow. Stephenson’s contact information on the right side of Rascoff’s listing indicates that Stephenson has received an average of five out of five stars in 35 reviews, and that he has recently sold 33 properties. Visitors can click on links to read those reviews and learn more about his recent transactions. 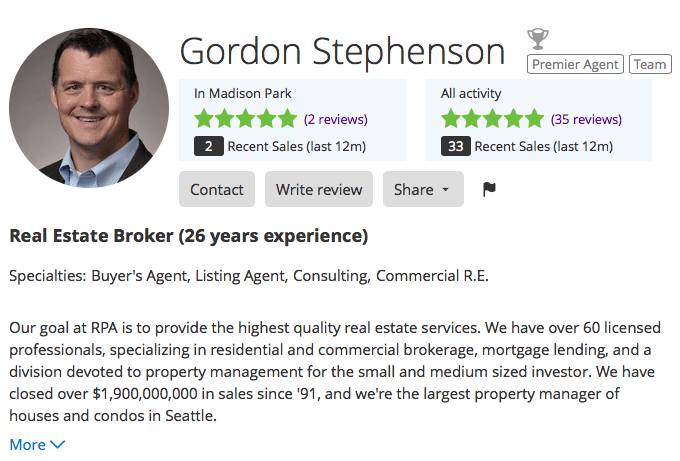 When Stephenson appears on other agents’ listings, those credentials may increase the chances that visitors will choose to contact him rather than the listing agent or the other buyer’s agent advertisers that show up alongside him. Indeed, real estate agents who find lots of success advertising on Zillow say it’s essential to accumulate as many reviews and sales records as possible to get the most mileage out of their exposure on the listing portal. Stephenson said his brokerage spends about $4,000 a month for exposure on Zillow. He said that advertising on Zillow has historically delivered a 300 to 500 percent return on investment. His brokerage’s agents, he said, generally convert anywhere from 7 to 10 percent of Zillow leads into closings, far above the typical online lead conversion rate reported by agents. 7. 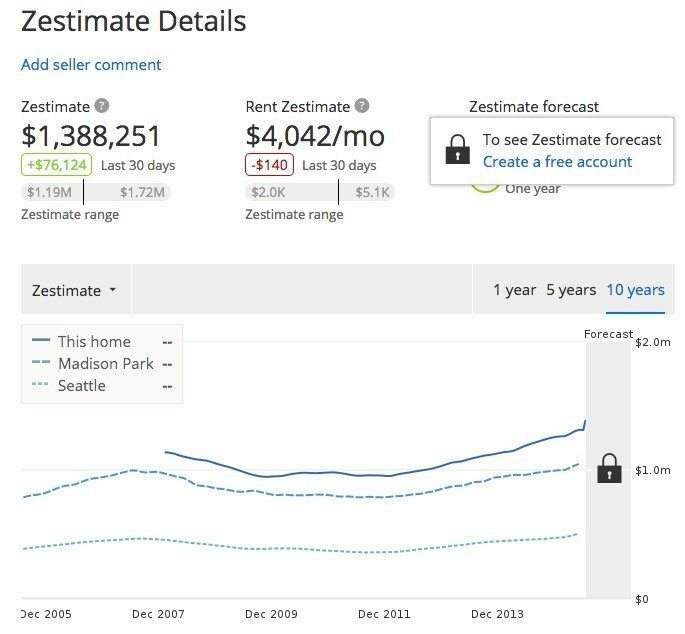 Zestimates can differ from a property’s listing price. This is not news to most, but it’s still worth bringing up because the Zestimate continues to color many agents’ perception of Zillow. On July 15, Zillow valued Rascoff’s home at about $1.39 million. That’s 7.36 percent higher than what Rascoff listed the home for: $1.295 million. Stephenson speculates that Zillow overestimated the value of Rascoff’s home because its algorithm might not have accounted for the home’s unique floor plan, which he said may not appeal to as many people as a more typical floor plan. The Zestimate of Rascoff’s house. 8. Some Zestimates can play to a listing’s favor. If the Zestimate of Rascoff’s property were lower than its listing price, buyers who saw the property on Zillow might have been inclined to think Rascoff’s listing was overpriced. But the opposite is true in Rascoff’s case, meaning buyers might be more inclined to see the property as a bargain. “There is much more that goes into pricing a home than just the Zestimate, though it’s a great place to start the conversation,” he said. 9. The Zestimate’s national median error rate has improved. The Zestimate of Rascoff’s property may be 7.3 percent higher than his property’s listing price, but that discrepancy is still smaller than it might have been a few years ago. Moreover, it’s important to bear in mind that the gap between the property’s sales price and Zestimate might shrink if buyers bid up the home’s price. For all we know, Rascoff’s agent may have underpriced the home to spark a bidding war. Zillow puts the Zestimate’s national median error rate at 8.3 percent, meaning half of Zestimates nationwide were within 8.3 percent of a home’s selling price and half are off by more than 8.3 percent. That’s down from 13.6 percent in 2006, according to Zillow. Editor’s note: This story has been updated to correct that over 9,000 brokerages provide direct listing feeds to Zillow, not 5,000. Small Talk Big Talk: All quiet on the Zillow front -- what's up?